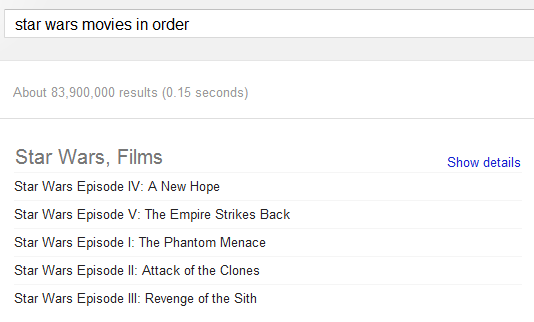 Google's OneBox for instant answers has a new interface that emphasizes the results. Google now displays the answer on the first line and the font size is bigger. The Q&A OneBox now shows multiple answers for questions like [What is the cast of The Help?] or queries like [the dictator actors]. Until now, Google used the following template: "Best guess for ... is ...". 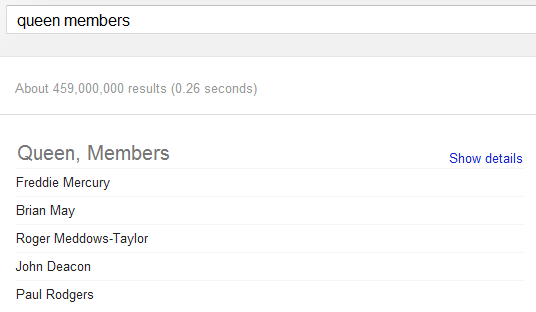 Just because Google no longer mentions that the answer is a "guess" doesn't mean that it's always accurate. I like the interface, but it may mislead the user in treating the answer given as the correct truth. When I drilled into the links where the first answer is extracted from, i.e. 1958 as the date Sydney Opera House was built, I can see that it is not correct. you mean how old was MT when he died? 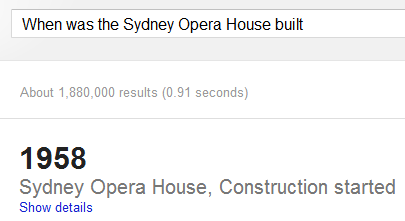 No, I was referring to the answer given for the question "When was the Sydney Opera House built" (which is "1958"). If you drill into the links provided, the first link points to Wikipedia, and the sentence where the answer was extracted from is, "The Fort Macquarie Tram Depot, occupying the site at the time of these plans, was demolished in 1958 and formal construction of the Opera House began in March 1959." For the Mark Twain's example, it is easy for the human user to figure that the answer given is wrong, but for the Sydney Opera House case, the average user will very much less suspecting. Results should be more detailed. 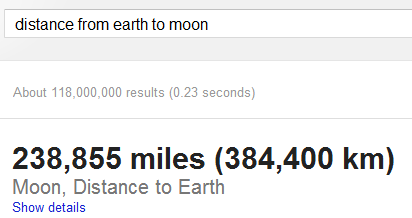 For a query like distance of the Moon, the result should contain Average distance also distance at perigee/apogee. Otherwise it is misleading and inaccurate. I would love to get a ten sentence overview when I query a subject. 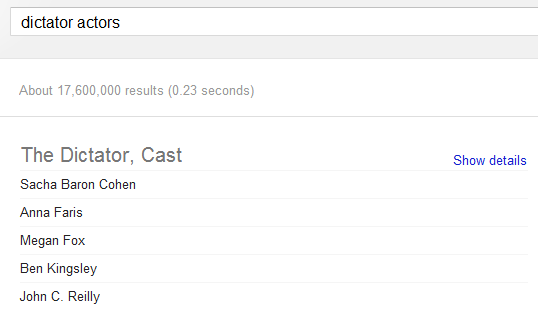 If you query for example a cast of a TV show the result is just the actors name in plain text. At least they should show the role they play, ideally with link to IMDB or Wikipedia. 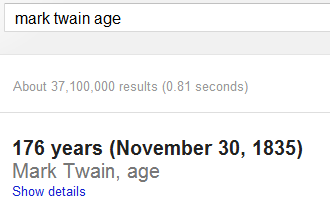 A query like "Mark Twain age" obviously should return the date of his birth death, his age when he died, and *maybe* the number of years since his birth. Point is not giving an answer is better than giving the a wrong or misleading answer. Return of the Jedi was insignificant. 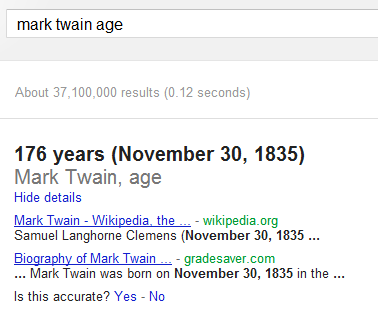 Another cool query is "How old is Larry Page"